Hello! Welcome to the online site of Jamie’s Pro Stringing. 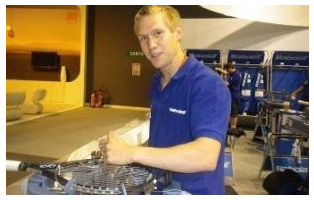 I am one of the world’s top professional tennis racquet stringers, based in Sidcup, in Kent, and covering the Bexley, south-east London and Medway area. Click here to see more about me. Jamie’s Pro Stringing are highly experienced and use only the best strings and top quality stringing equipment, as used on the ATP and WTA Tours, to provide a local stringing service at world class professional standards, and at an affordable and competitive cost. My service costs start at just £8 for those who provide their own string and £12 for strings I stock, which is less than many high street sports shops and also other online providers. Being a professional stringer on the Pro Tour, and having strung for more than 80% of the world’s top 100 professional players, including world number one’s and Grand Slam champions, I know how to provide and deliver the best quality racquet stringing. I am based in Sidcup and work in Gillingham, but am happy to offer a mail order service for those not local to my area. Check out my prices, give me a try, and I’ll demonstrate the quality of my work. I am more than happy to give free advice on helping you to choose the right strings, and can also advise on choice of tennis racquets.